EFAs help to maintain healthy blood pressure and normal blood cholesterol. Both factors are vital for your heart health. Research studies indicate omega oils improve insulin sensitivity and reduce metabolic resistance. High metabolic resistance makes weight loss harder. On ketogenic diets, it can stall your transition to ketosis. EFAs can only come from food or from supplements – your body doesn’t produce them. 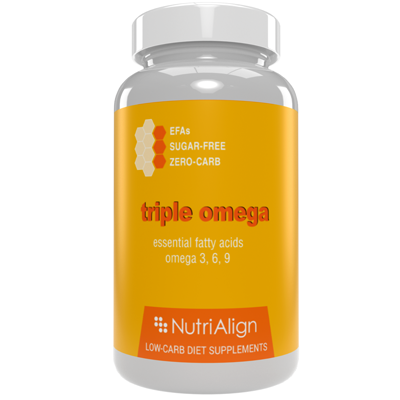 Nutri-Align Triple Omega includes EFAs from pure natural sources – fish oil (400mg), flaxseed oil (300mg) and sunflower oil (290mg). Plus Vitamin E (10mg) to stabilise the oils and prevent rancidity. EFAs have proven strong benefits for heart health. If your doctor is concerned about the impact of low-carb high-fat diet on your heart and cholesterol, omega oils supplementation may be recommended. Some researchers found EFAs to have positive effects on metabolic resistance and insulin sensitivity. Both are important for weight loss and efficient fat metabolism on a low-carb diet. Dr Atkins recommended EFA supplements to cover all three types of omega oils – 3, 6 and 9. All supplements pots are double-sealed, so you can be sure the product is pure and untampered. The dosages listed below are guideline only. Ideally, consult your GP or a registered dietitian to get personalised advice on optimum supplementation for you. Contains ingredients derived from beef and fish. We are confident that our supplements will make your low-carb diet easier. If you are on any prescription medications, are pregnant of lactating, have a medical condition or any concerns about the suitability of our products, please consult a healthcare professional before using this product. Do not exceed stated dose. Store in a cool dry place. Keep away from children at all times. Do not use if seal is broken. Flachs, P., Rossmeisl, M., Bryhn, M. and Kopecky, J. (2009). Cellular and molecular effects of n −3 polyunsaturated fatty acids on adipose tissue biology and metabolism. Clin. Sci., 116(1), pp.1-16. Gonzalez-Periz, A., Horrillo, R., Ferre, N., Gronert, K., Dong, B., Moran-Salvador, E., Titos, E., Martinez-Clemente, M., Lopez-Parra, M., Arroyo, V. and Claria, J. (2009). Obesity-induced insulin resistance and hepatic steatosis are alleviated by -3 fatty acids: a role for resolvins and protectins. The FASEB Journal, 23(6), pp.1946-1957. Lorente-Cebrián, S., Costa, A., Navas-Carretero, S., Zabala, M., Martínez, J. and Moreno-Aliaga, M. (2013). Role of omega-3 fatty acids in obesity, metabolic syndrome, and cardiovascular diseases: a review of the evidence. Journal of Physiology and Biochemistry, 69(3), pp.633-651. Munro, I. and Garg, M. (2013). Prior supplementation with long chain omega-3 polyunsaturated fatty acids promotes weight loss in obese adults: a double-blinded randomised controlled trial. Food & Function, 4(4), p.650. Martínez-Fernández, L., Laiglesia, L., Huerta, A., Martínez, J. and Moreno-Aliaga, M. (2015). Omega-3 fatty acids and adipose tissue function in obesity and metabolic syndrome. Prostaglandins & Other Lipid Mediators.